A Week of Hope, with a card. let me know about this great idea. It is as simple as it states spread hope with a card. I thought I'd participate so what else is a girl to do but flip through Jenn's book and get an idea. The card on the left is what jumped out at me as a great idea. All one letter. I love the letter "Y" and I love the phrase "why not" but I like to do it "Y Knot"
And Y Knot spread hope? So I grabbed some pretty fall colored paper from the stash and die cut a bunch of different sizes and shapes of the letter "y" using the Opposites Attract font with my Cricut. Then all I did was glue them down in a nice random way. To make my "not" or "knot" I tied a small piece of yarn into a knot and glued it down in the bottom right corner. This one will be sent out but I should mention that if you save your cards and are looking for a good way to store them so you can flip though them easily you can grab yourself a Card Album. I love keeping my cards that have been sent to me in one and I keep the ones I've made in another so that when I need one to send I can easily flip though and pullout just the right one for the occasion. If you need more ideas click on the "card making" link below or grab a copy of The Cardmaker’s Workbook. 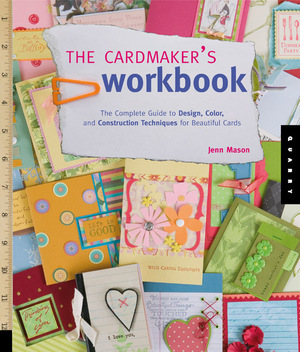 The Cardmaker’s Workbook is the only book on cardmaking that a crafter will ever need, and is formatted in a sturdy volume that can kept on the desk and referred to again and again. The book is divided into chapters focusing on composition, color, theme, construction and inspiration. Instructions are clear but concise, making room for large pictures and multiple variations. It has the look of a designer's notebook with sketches and templates that show different card formats. Unlike other cardmaking books available that are occasion driven or aren’t stylized, The Cardmaker’s Workbook provides an inspiring and hands-on tool for paper addicts to use to expand their skills and stretch their imagination. The designs cover many different styles, from detailed multi-layered beauties to simple cards that can be quickly made and given as a set of stationery. There is more info including a video and a great book giveaway over at Jenn's blog, Everyday Artist Studio and an online card company is also giving away free cards… www.cardstore.com. Spread the word, and the word is HOPE! It's time for back to school fashions and Madge has whipped up a fab tiny Moulin Rouge inspired top hat headband project for your discerning teen...or any gal who likes a little splash of whimsy in her accessories! Find out how to can make a story sack for the book, and soon to be movie, Cloudy With a Change of Meatballs. Make cute-as-a-button frames to match with your favorite picture! Sometimes, you've just gotta go against the grain. Find out when and share your comments about stitching against the grain. Have you ever tried using heavy watercolor paper to make a peeled paper collage? A reader asks, "What are the pros and cons of selling crafts online?" Eileen answers. Drew gives good advice on how to handle the non-crafty people (muggles) in your world. Aileen's created a quirky copper bird pin,,,,stop by and check it. Alexa revisits and reconnects with a craft from her childhood. You'll find some big crochet fun in these new little books published by Leisure Arts and written by Drew, The Crochet Dude! Sister Diane's new podcast compares two ways to publish a craft book: the traditional print and publisher method, and the ebook method. If you dream of writing a craft book, this is useful information. -Be sure to pop over there and read about her crafty world. Their book give away is over but all you need to do is leave a question here and you are entered to win a free craft book and this is the last week to be entered to win a bobbin winder! Jenn Mason is a very talented designer, here are just some of the books she's authored and co-authored. Click here to see inside peeks and projects from them, then pop on over to Amazon to score yourself some, I know you will want to. I keep going back to them time and again for cool designs and inspiration. And speaking of cool designs she has this great line of stuff with Creative Imaginations called Parts and Parcels. It is absolutely perfect for my growing collection of ATCs. It will fit 144! I just finished filling my first book. I used photo corners so that I could slide the ATC's out if I wanted to swap or rearange. Have you thought about taking your craft hobby to a different level? Tammy has some thoughts to consider before crossing over the hobby/professional line. SisterDiane is thrilled to unveil her new ebook, Weaving Un-Loomed: Simple Ways to Weave Cool Things. Have fun trying out these new free Candlewicking patterns Connie's sharing. If you use one, send in a photo to show it off! Using two very different book pages, you can create a found poem for an altered book...or just because! Jen shares clever and crafty uses for suitcases that have nothing to do with holding clothing. Side tables, laptop cases and portable craft studios oh my! Drink Mermaids take the plunge into some silver paint and get transformed into some swimmingly fun necklaces inspired by the wonderfully innovative book- A Charming Exchange. Eileen shows you how to make a multi-strand fiber bracelet. Drew reviews the new Simplicty Rotary Cutting Maching - offers up a free crocheted project using fabric strips - and he's giving away a Rotary Cutting Machine to one lucky commenter! Madge shows you how to make a quick and easy Altered Chinese Paper Lantern in her first post on Kid/Teen Crafts for I Love to Create! Check out Vickie's free pattern for a knitted lace, iPhone cozy! I need your help! Be the first to submit a photo of this completed craft and be featured on the Family Crafts site! Your help is needed...Please take a moment to help make a difference We have a chance to get our ovarian cancer charity project on the cover of a northern CA magazine. Your vote is needed! The project benefits the Ovarian Cancer Research Fund. Deadline for voting is July 23rd so hurry and cast your vote! I love Jenn Mason and I loved making this video where she showed us how to make an over-sized matchbook that made a great gift envelope for the plastic tube and paper necklace she also gives us the 411 on how to make. Paper is a wonderful medium for creating jewelry: It’s lightweight, easy to work with, and comes in a dazzling array of styles, patterns, weights, and designs. 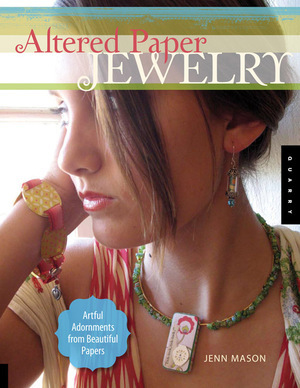 By mixing relatively simple jewelry-making methods with standard paper arts techniques, Altered Paper Jewelry offers paper crafters, altered art aficionados, and jewelry makers creative new ideas for creating stylish and contemporary jewelry from gorgeous paper. In this book, bracelets, necklaces, earrings and other jewelry are decorated and constructed with found paper, photos and beautiful scrapbook papers. Beads are fashioned from rolled paper, covered with decoupage, and molded with paper craft accessories. Paper-like materials such as vellum, transparencies, shrink plastic, and printable fabric paper are punched, cut, shrunk, and rolled into mini wearable masterpieces. Paper is folded into lockets, embedded into belt buckles, and glued into unique shapes, all in the pursuit of personal adornment. Illustrated step-by-step instructions and templates are included. Click on Jenn's name below to see more inside peeks from her great books. Have you dyed plastic before? If not what was the most bizarre thing you have changed to color of? And as a thanks for sharing you will be entered to win a free book. "I" is for Informative Paper Bead, I love it when my Jewelry has something to say! This is such a pretty and easy project to make with paper! Click on image to read the full directions. I love this simple yet elegant bead. Have you guessed where this project is from? Here is the bead I made using Jenn's great instructions. I did add a bit of Crafty Chica Glitter onto the bead by mixing it in with a bit of her Glossy Gloss Varnish. Yes, that is a noose. To see the rest of the piece of jewelry that the bead is used in, pop on over to Sweater Surgery. Do you have an image or topic you consistently use in your designs? I have been using deer and antlers a lot and I use bunnies in tons of stuff. I liked this noose from a cartoon because I thought it mimicked the texture of the phone cord. Or do you use random images and topics? Leave your answer in the comments and as a thanks for sharing you will be entered to win a free book!